For this year, Master's athletes must have birth dates on or before July 15, 1960. Registration at the Regionals will be first come, first served (no qualifying required). We will announce the dates for when you can register shortly. Scaling options will be available, but they will disqualify you for the Games. The Master's qualifiers are worldwide. Folks will compete at their closest Regional, but they are competing against all other Masters all over the world for the Aromas spots. There are no fixed spots allocated to each Regional, and it's possible that some Regionals won't send any Master's athletes to Aromas. The workouts and scoring will be announced in April, and each Regional will have exactly the same workouts. The top scoring 15 men and 15 women from all around the world will come to Aromas in July to compete for Master's Champion. "Registration at the Regionals is open (first come first served)"
When you go to the regional site(s) (I tried several) you see a statement "Registration will be open soon" Am I experiencing a unique problem or is Registration not open? 08 January 2010 / 8:54 p.m. I believe open registration refers to the fact that anyone can register on a first come, first served basis, not whether or not registration is up and live, but I understand the confusion. HQ Question: The big one, which may have been answered somewhere else that I missed, what is the minimum age for masters? I am guessing 50 but some masters divisions are 40. 08 January 2010 / 9:54 p.m.
ryan - age cut off is 50. wish it were 45. 09 January 2010 / 4:49 a.m. So . . . Master's qualifying will take place at the same time as affiliates? When regional registration opens? 09 January 2010 / 6:04 a.m. Thanks for the questions. The post was unclear and has been updated. The qualifying events for the Master's Games in Aromas will take place as part of the Regional qualifiers. 09 January 2010 / 7:46 a.m. I have sent a couple of emails to the crossfitgames email with no response. Just wanted to get some info on competing @ the Georgia Sectional Qualifier Feb 26th and 27th. I am a disabled athlete and need to make sure proper modifications can be made in order to compete. Since there is no current Disabled division in place will this be a problem and how can I qualify? 09 January 2010 / 12:39 p.m.
Sir, I kind of jumped the gun on registering for the masters division. I registered with the herd and received email confirmation. Now I read your having a seperate registration. Can I just show my confirmation at the event in West Palm Beach FL. on 13 March? 09 January 2010 / 5 p.m. I STRONGLY believe that Masters should begin at least at 45. There is going to be a huge gap between the ages of the regular competitors and the Masters if the cutoff is 50. I strongly urge the event sponsors to consider that the overwhelming numbers of elite atheletes in the sub-40 range are more than likely going to dominate the sectionals and regionals, because 40 year old tendons - like it or not - lack the spring of 30 and 20. If there is no Intermediate division (another viable alternative), then the current classification scheme threatens to squeeze out a significant cross-section of possible competitors. Sure, there will be hundreds of sub-40 competitors, but I believe that very few near-40 to 49's will be able to qualify, which effectively excludes us from competition for up to 10 years. Please give this some further thought. 11 January 2010 / 9:49 a.m. While I agree with John regarding the 40-49 group, there is no way most 50+ athletes could hang with the younger 40-45 guys. There is no way to make all happy. I have done some strength competitions that have masters starting at 55yrs of age. Maybe next year they will expand the masters. But this year they have already set the bar. 11 January 2010 / 12:54 p.m.
11 January 2010 / 5:37 p.m. I agree with all the posts - the ideal would be to have an over-40 and over-50 even an over-60. But it is about potential numbers and getting started - I am sure HQ understand the physiology of aging. It would not surprise me that this is a run through to see how a masters division works out - keep in mind many of us are very fit BUT very busy with jobs and families (as are some of the young athlete too of course). HQ may be interested to see what response they get and then build from there. Just look at the growth since 2007 for the main competition! Another consideration for them might be that an over-40 division would be large and add too much of an administration burden, at this time. As CrossFit grows maybe we'll eventually see over-35, over-40, over-45 etc. Such small age divisions already happens in some sports - in my home town of Vancouver they have over-35 Soccer leagues, over-40, over-50, over-55. Such groupings are ideal but you have to start slowly and see how things workout. I'll be 54 by competition time - maybe a bit too late but I applaud CrossFit for starting a masters division. 11 January 2010 / 8:01 p.m.
12 January 2010 / 10:22 a.m. Wondering how many participants will they take for the Masters Regionals? Since it's first come first serve. It would be nice if there was a place to sign up with your email for the notification or announcements. When you get old you sometimes forget to check the Games website everyday. 12 January 2010 / 11:26 a.m.
13 January 2010 / 9:50 a.m. Thanks for creating this Masters division...I will now have a new goal for next year. It would be great to get a spot when I am 55. 17 January 2010 / 7 p.m. I'm a masters. It says that masters can qualify at "their closest Regional." My closest Regional is Albany (May 22-23), but I live in Ontario. 23 January 2010 / 10:03 a.m. Thanks for adding the Master's division to the Regionals. I hope that is in the future this can be expanded to 40+, 50+, and even 60+. As a current 50 year old, this give me a goal to shoot for this year! Any clue as to when the registration with start? After the Sectionals? As Terry says, us old guys are sometimes a little slow to check the website! Thanks to Crossfit for all you do! 26 January 2010 / 8:19 a.m.
Any more guidance on Masters Registration? Does first come first serve mean we show up at the regional in the morning and get in line or will we register online? Looking forward to the challenge at 52.5! 29 January 2010 / 5:42 p.m.
01 February 2010 / 11:16 a.m. I hope it will all be rx'd. There are only 30 (15 M/F) WORLDWIDE at the finals. I think the Masters group will smoke! Please don't scale. 03 February 2010 / 9:19 p.m. Thanks CrossFit for doing this Master's Division. I'd like to try it. How do I register? 04 February 2010 / 12:49 p.m.
Jan, I think you miss the point on scaling. Certainly there are many Masters athletes who can do most WOD's Rx'd but the inevitable fact of ageing is you lose some ability, strength etc. Whilst we can do them Rx'd, intensity goes out the door at times & the WOD's become an endurance event. Example - let's say the top 5 open men complete a WOD in 6 or 7 minutes. If a Masters competitor does the same WOD Rx'd & get 10-12 minutes are they getting the same effect or are they better scaled & completing the WOD in the same 6-7 minutes with more intensity than the unscaled time. The extra time Rx'd is usually spent recovering breath, energy etc. I doubt many or any masters would have made it through the same two days of WOD's Rx'd as last years finalists & if they did the times would certainly blow way out. I understand your desire to see masters smoke the WOD but even with some scaling they will still smoke stuff most mere mortals of the same age can only dream of; in fact non CF mere mortals would probably consider any games WOD a nightmare. 04 February 2010 / 5:46 p.m. Very good points. My starting assumption is that Masters will not be doing the same WODs at the Games as the main competitors. 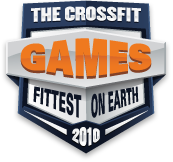 I don't believe, and correct me on this if I am wrong, that the affiliate cup competitors do the exact same WOD as the main competitors at the Games. PS: Can anyone answer my question about which regional to attend? 05 February 2010 / 8:58 p.m.
Keep masters at 50. It is unfair to all the late 40 somethings that have been looking forward to being seperated to a level playing field. 06 February 2010 / 2:33 p.m. I agree with Lisa. I think 50+ is a good starting point for Masters, especially women. Hormone and other changes, post menopause usually around 50, definately affects athletic ability. 06 February 2010 / 5:04 p.m. I agree Todd. Keep Masters at 50. 06 February 2010 / 5:16 p.m. I for one am happy with the 50+ for masters, they just cannot please everyone. Also, no scaling. 50 year olds are crossfitters too, we do it every day in the gym so no reason to scale it. 09 February 2010 / 7:19 p.m.
09 February 2010 / 7:21 p.m.
John, check my comments above re scaling. If you mean bands for pull ups etc, then I agree but reduced weight or less reps would be wise. It's just a fact that 50 year olds can't work as hard as 30 year olds. If I scale I get the intensity, if I don't scale I get the WOD but with lots offf rest & slowly. Example - todays WOD. AMRAP 20mins 5DL @145kg (320 pounds) & 15 push ups. At 145kg one guy did 7 rounds = 1015kg, I did 10 rounds @ 110kg = 1100kg. Who did more work? I know who had more rest!!!! 10 February 2010 / 12:35 a.m. I agree with Graeme, at 59 and Crossfitting (Crossfit Watertown) for two years and completed an L1 Cert.,I intend to register at my Regional as soon as available. The only workouts I would not want to see scaled, if they are used, would be any of the "Crossfit Benchmark Workouts" ie; "Fran"
10 February 2010 / 2:19 p.m.
Rich, I agree with this one. 95lb thrusters are within the range of 50+ athletes & although times would be slower they are not 10 mins+. I think when there's overhead stuff like C&j etc or some other challenging movement there should be some consideration given. I doubt any over 50 would have completed last years 2 days as rx'd at the mens weights or at least not within the time limits. 10 February 2010 / 2:35 p.m.
50 is the right age for a Master's division. I'll see you in 2011 when I've turned 50. 11 February 2010 / 3:39 p.m.
Register at regionals as regular competitor and the masters category will get sorted out? Please advise? 15 February 2010 / 8:35 p.m.
As I understand it, the Masters will be a seperate registration but it's not open yet. You can't register as a competitor at regionals as you have to qualify through sectionals. 15 February 2010 / 11:58 p.m.
22 February 2010 / 4:36 p.m. Seems like they got the Master division about right. Not everyone is happy, but enough. I'll be ready by 2012. So what I really want to know is how I compare with other old, heavy guys. I can do a couple MUs, put my BWT overhead from the ground, Fran sub-6, alas I don't belong to an affiliate. Working on Isabel. 22 February 2010 / 7:12 p.m. If you publish the link, they will come. Where is the link to register. Do we register at the Regional as a regular competitor? 24 February 2010 / 4:44 a.m. The link is on the regionals registration page, there's a seperate Masters registration. There is a link to it on the post announcing the event, now about three or four posts down on the first page of games info. 24 February 2010 / 10:33 a.m.
about the mittle of that page you'll see the link. chris one of the masters you'll see his picture doing a dead lift. 24 February 2010 / 10:54 a.m.
A 50 masters point is excellent, I was told 40 at my gym which left this 57yo with no interest, I can't compete with 40yo's, but I can compete with the 50 and ups. Now I'm fired up to compete, don't change the WOD. 09 March 2010 / 5:31 p.m. I am waiting for 62+ division but will do this years masters with the kids. 12 March 2010 / 9:09 p.m.
12 March 2010 / 9:11 p.m. I am 60 years old and would love to compete. Is any thought being given to a senior's division at the games? It would be difficult for me to compete with 40-year olds. 21 March 2010 / 11:25 a.m. Yes Heather, there's a link at the top of this item to the registration pages. You register under your regional. The Masters is over 50 so you'll be Ok.
22 March 2010 / 11:24 a.m.
26 March 2010 / 12:42 p.m. I am pumped for the master's. 50+ is a great place to start. I can hang with alot of the 40 and younger as far as times, but still have to scale my workouts down when it comes to lifting heavy stuff........so looking forward to training for the 2011, gives me something to look forward to when I am 50! 26 March 2010 / 1:44 p.m. I am 50 something qualify for masters cause of the year I arrived wished I was 26 will be competing at the games in Sydney wishing all us old farts good luck! 03 April 2010 / 12:23 a.m. I am pretty new to Crossfit, but next year I plan to compete in the masters div. 05 April 2010 / 8:48 a.m. I'll be ready in 2014! I would like to be a volunteer or spectator @ Masters! 20 April 2010 / 6:06 p.m.
"The workouts and scoring will be announced in April"
22 April 2010 / 12:13 p.m. 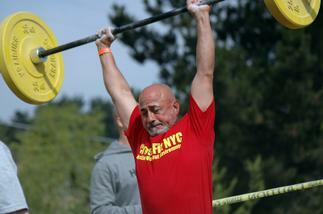 It is wonderful Crossfit opened a Masters division for 50+. I feel a 40+ division is very wise to boost the popular demand for the games. I hope the 50+ division was a baseline and Crossfit will see that the demand is there.... so please open up 30+, 40+, 50+ and even 60+ will bring more people to the sport!!!! 24 May 2010 / 1:19 p.m. I have been doing Cossfit for over a year...... 3 times a week. I am 70+ and would be happy to see a division that would inspire us older members. I workout with mostly 20 & 30 year olds and often feel like I am on the outside looking in. I do finish the WODs as posted however I set my own personal goals in many cases.......scaling down reps and weights. 27 May 2010 / 7:17 a.m.
18 July 2010 / 6:03 a.m.
We will see if O50 unmodified is possible, and that's the point. I'll be 49 this year, best with cardio, back and leg strength. CF regularly for 1 year, second ACL operation 9 months ago, right shoulder repair 5 yrs ago. At 175# I can complete many running and cardio workouts competitive with the 30-40 yo's, sometimes finish first without modification. DL only 320#, but knee is still healing, so figure 400# would be possible eventually. For my weaker exercises, women's Rx is usually fine, but I would get hurt trying to do men's Rx. I believe at 185 it would be at the extreme end of theoretically possible for me to complete Rx weight and time for strength events, but at that weight I can't perform as well in cardio. I know better athletes my age and older who clearly could compete with unmodified CF workouts safely, but only a very few. I will aim for that in 2011, but does it matter if I succeed. just knowing that someone did it in 2010 will motivate me every day to push myself harder. isn't that the point of having these competitions? Just thinking about what I might be able to accomplish to write this has helped motivate me already! 03 December 2010 / 4:08 p.m. Anyone who says age is just a number should be flogged. I am 56 and started crossfit in October of 2010. My son is a top competitor and got me into it. I have been an athlete all my life and was a competitive powerlifter and bodybuilder in my youth. Since I have started crossfit I feel like I am learning, figuratively speaking, to walk again. Anyone who calls these competitors less than the most fit people in the world should step in the ring and give it a try. I feel that in time there will be separate divisions to accommodate everyone. This sport is growing so fast you guys @ HQ are going to have your hands full. Just a thought..... Elite, Masters and Grand Masters? I wish this would have been around when I was young. 05 January 2011 / 2:18 p.m. I am 60 and do crossfit and want to compete in the 2012 masters, but I started Crossfit at 55 and I have to say at 60 it is truly differnet 5 years later. I think it has to start at 50 an then maybe have an over 60. 09 February 2011 / 11:31 a.m. I will be 40 next year and there is no way I can keep up with the 18 to 20 somethings. I do my best. I do think they should have another group between super young and age 5o...that's just common sense. 15 March 2011 / 10:35 a.m.